Today I went out for the first time on my own with the two boys. I must say in the days leading up to this I was pretty anxious about venturing out on my own with them! How would I keep hold of and entertain a toddler when the baby needed a feed or change or cuddle? How would I get them safely in and out of the car? Where would I go? 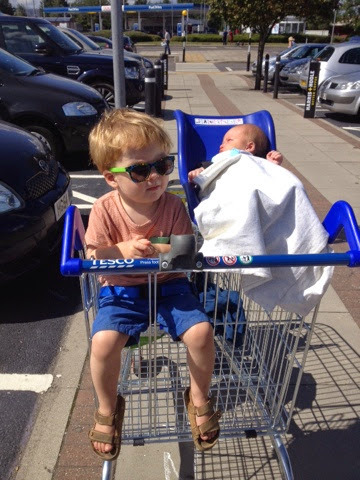 I didn't know but I did my best to be prepared - About halfway trough the pregnancy I had purchased a brand new, shiney Phil&Teds tandem 'dot' pushchair. I've never been one to spend much money on stuff like this and for over £400 (with raincover and extra seat) I was nervous I had made the right decision but so far it has been a godsend! It is heavy but does it's job well, it fits in the boot of my tiny car without removing wheels or anything and is comfy for both boys. Samuel can snuggle in the underneath lying flat and away from the strong sunshine or wind and Jacob can hop in and out of the chair on top when he needs to. 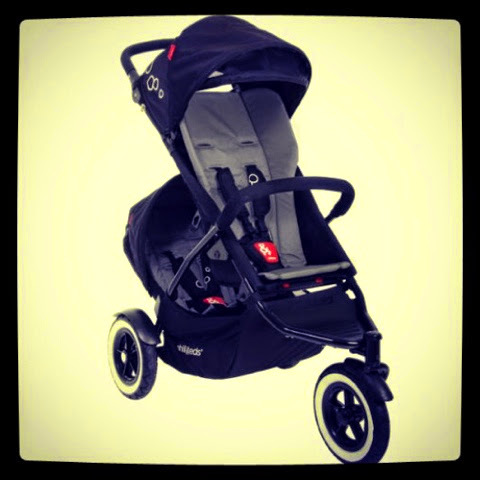 It is the best pushchair I have had and glides around effortlessly. The soft handle means no blisters (I did get blisters from my first buggy!). The three wheel design and single bar handle makes pushing with one hand very easy too. I love it. My first trip out was to meet some friends from work at a local indoor soft play area. My usual opinion of these places is pretty negative - just a place to dump your kids so you can sit and chill out - not very wholesome entertainment (I thought). But now I'm wondering what the matter is with this approach occasionally. I think I'm going to have to do this sometimes for my own and the boy's sanity! As a two year old Jacob needs to be able to run free in a safe environment and I need to be able to rest now and again too. Don't get me wrong I had my eye on him the whole time but I could also talk to my friends and relax a bit too. It was good to catch up with the girls and to find something and somewhere I can go that works for us. I know I won't be down there every week but knowing it's an option made me feel more optimistic about when their daddy goes back to work. *since I first wrote this post I have now been on both these trips and both have been a success! The zoo would have been really hard without the boy's dad there but we had a great time. The shops and supermarket were a challenge but we got it all done and got home in one piece. (I think tesco.com might still be the way forward though - at least for a while!) Who would have thought that something so simple could be such a challenge? Life with two boys is going to take some getting used to. I know the challenges will change as they grow but I'm ready to try my best. Now for some sleep.